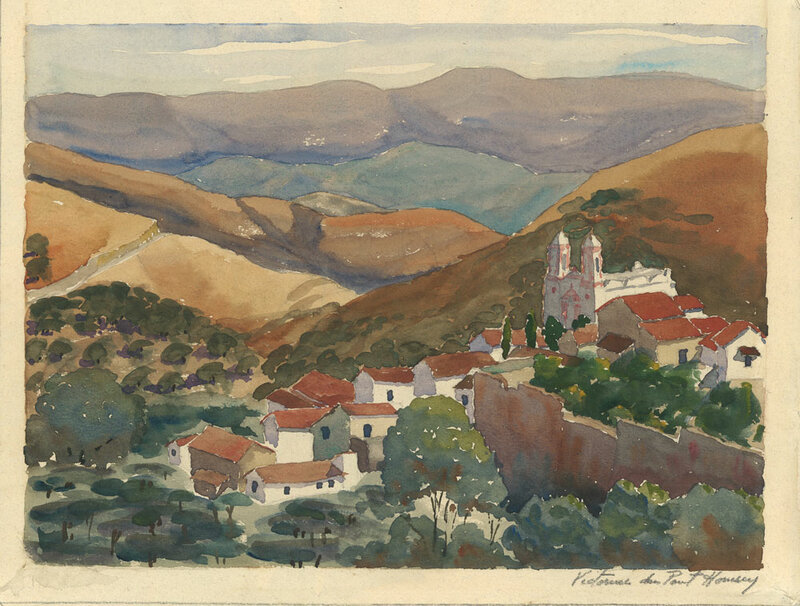 Homsey Architects co-founder, Samuel Homsey, was well known for his watercolors of architectural landmarks and other scenes he painted on his world travels. Several of his pieces are in the collection of the Boston Museum of Fine Arts, the Delaware Art Museum, and the Biggs Museum of American Art in Dover, DE. The Homsey's started the tradition of featuring one of his works on the company Christmas card back in the 1940's. Homsey Architects has continued the tradition with a New Year's keepsake bookmark featuring a different painting each year. Most people don't know that Sam's wife and co-founder, Victorine, was a talented watercolorist herself. Less prolific than Sam, examples of her work are quite rare. This year Homsey Architects unearthed one of her landscapes from the archives to use on the annual bookmark. The scene depicts a hill town in the South of France where the Homseys travelled in the 1930's. The Homseys' dedication to observing and recording the beauty around them continue to be an inspiration to us today.